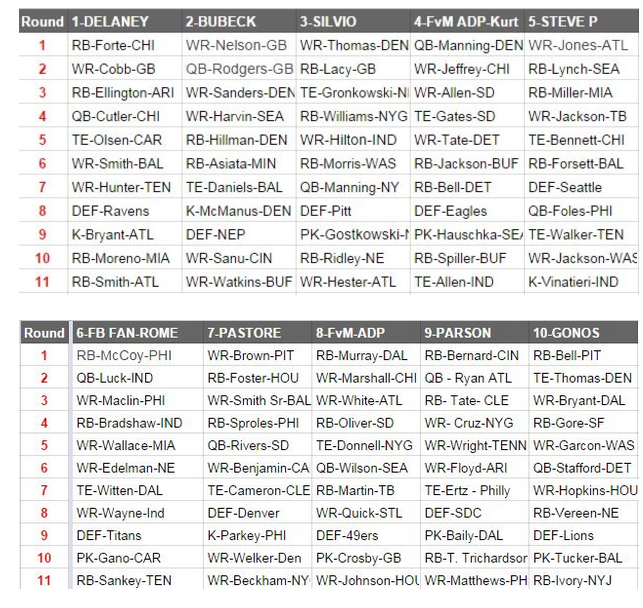 For the SKYLLZONE Week 6 Expert Draft, I decided to select a mix of players with a high over/under, as well as a few underdogs. The over/under for the Chicago Bears vs. Atlanta Falcons is slated at 54, which is the highest over/under of the week. The Falcons are favored by three points, so Cutler will be relied on to keep the Bears in the game. The Falcons’ defense is atrocious, ranking 23rd against the pass and 28th against the run, and I expect Matt Forte to break off some dump-off passes for big gains. With a healthier Brandon Marshall in the lineup, and Alshon Jeffery and Martellus Bennett in the mix, there should be plenty of fantasy points attached to Cutler’s name in Week 6. Forte was my first pick in the draft. As a dual-threat back, he has several ways in which he can score me points, and as mentioned above, he is going against a very weak defense. Forte is a key component of this offense, and he will be relied on heavily. Without any clear indication of who will start at the quarterback position for the Arizona Cardinals, I went with Ellington because of the huge workload he should see in Week 6. With a receiving and rushing touchdown in Week 5, Ellington proved why he is such a dynamic playmaker. Even if Carson Palmer returns to the lineup, the 25-year old running back should make his owners happy in Week 6. In the off chance he does play, I wanted him on my bench. He is one of the best pass-blocking backs in the NFL, which allows him to see the field often. Moreno will quickly regain a primary role in the Miami Dolphins’ offense if he can stay healthy. He has yet to record more than four total touches in a game this year, but Antone Smith doesn’t need much to rack up fantasy points. In the two games where Smith rushed the ball four times, he averaged 14 yards per carry. With four touchdowns so far this season, I don’t mind giving Smith a spot on my bench. The Miami Dolphins‘ defense has currently allowed an average of 24.25 points per game this season, and I think Aaron Rodgers will help to raise that total. He already has six touchdowns for the season, and he has shown he can still produce solid fantasy numbers next to Jordan Nelson. The theme for the Baltimore Ravens‘ offense seems to be centered around the fact that Torrey Smith needs to be more involved, but we really have yet to see it. In Week 6, I finally expect Smith to see the targets he has been promised. It is important to note, however, that Smith has been involved in six defensive interference calls, which has limited his ability to haul in the deep ball. I think this is the week he breaks free, and he should be readily available in your SKYLLZONE drafts. I don’t think he will accomplish too much with Charlie Whitehurst as his quarterback, but Justin Hunter has a great matchup against the hopeless defense of the Jacksonville Jaguars. He was involved in 68-of-70 snaps in Week 5, and Hunter was able to turn three receptions into 99 receiving yards and a touchdown. He will most likely sit on my bench. but I love the fact that he is still at my disposal. Outside of a shaky Week 4 performance against the Ravens’ defense, Greg Olsen has averaged a healthy 6.25 receptions per game. Cam Newton is only averaging 10.5 rushing yards per game this year, and he is relying on his arm more than ever before. Olsen is clearly his favorite target, and I expect a strong outing for the tight end in Week 6. I went back to the over/under when it was time to pick a kicker. With such a high scoring affair, Matt Bryant should see plenty of opportunities to find fantasy gold. The Tampa Bay Buccaneers‘ offense may find a week to bring everything together, but I don’t expect that to be in Week 6. Even in a very ugly game, the Baltimore Ravens’ defense was still able to hold its own against Andrew Luck, and Mike Glennon is not Andrew Luck. I think the Ravens’ defense will shut down the Buccaneers’ rushing attack, and it will force Glennon to throw and make a few choices he doesn’t want to. I am hoping those choices turn into turnovers. Good luck in your SKYLLZONE Week 6 drafts, and if you haven’t signed up yet, what are you waiting for?!? !